If you’re thinking “Wow, that’s a weird, winged three-wheeler,” you’re only half right. Because this thing had four wheels: one up front. two on the sides… and one more in the middle out back. The front wheel steers and the lone rear wheel is the only one the engine drives. The outboard wheels just ride along. Bizarre. This concept car was displayed by Pinin Farina in 1960. It’s a four-door sedan and the rear looks like a 1950s/60s-contemporary American boat and the front is entirely unique. The engine is a Fiat 1.1-lilter straight-four making 43 horsepower. It’s probably not too quick with only 43 horsepower and that’s probably for the best as the handling really isn’t great. But it is very aerodynamic. This car was listed for $3 million in the past five years so what it’ll bring is anybody’s guess. But it sure is interesting. Click here for more info and here for more from Barrett-Jackson in Scottsdale. 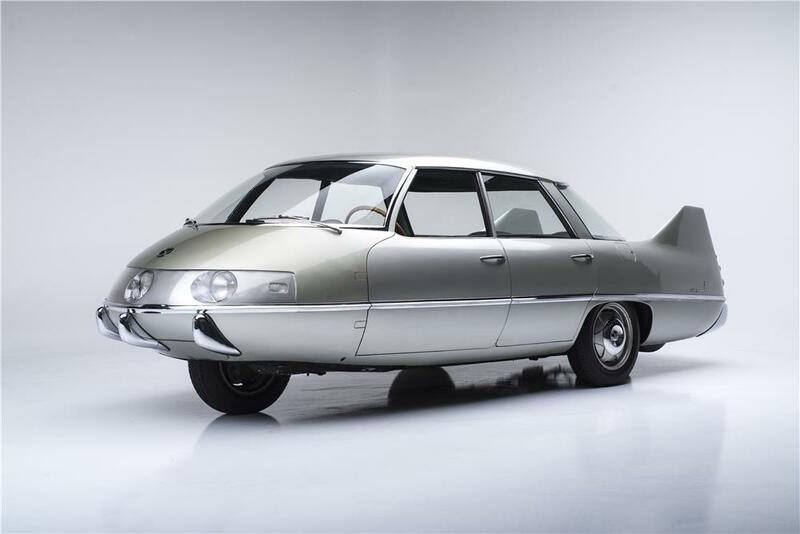 This entry was posted in Uncategorized and tagged 1960, auctions, barrett-jackson, cars, classic cars, concept, pininfarina, prototype, sedan, x by classiccarweekly. Bookmark the permalink.